The Dog bed industry in the UK has quite frankly gone a little nuts over the past few years. Innevitably American influences have meant we’ve seen an influx of luxury, crystal encrusted sofa like dog beds, which cost more than the average childrens bed at Ikea. Now when you bring home a fluffy, cute puppy, you’ll probably want to check how big the little fella is going to grow before you invest in an expensive bed. Personally, having grown up with healthy, happy dogs who slept on a rug on the floor, I was never going to be the ideal luxury dog bed consumer. I don’t know if we just got unlucky, but for the first 18 months Lupo ate and chewed anything including his bed, particularly when he was teething. Yes, dogs loose their baby teeth just like humans, I’ll do a seperate post about that joyful (messy) time. So we have had two dog beds in Lupo’s lifetime. 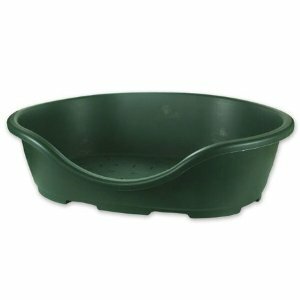 Both the oval, hard plastic kind found at pretty much any pet shop for under £20. The first was donated by the in-laws (when you don’t have kids this is the closest Grandparent behaviour they can get). We had to go up a size when he was getting a bit squashed. This plastic dog bed can be filled with blankets and towels and be perfectly comfortable. It’s easily cleaned but not indestructable. Even if we are in the same room as him he will lay upside down and graze on the plastic sides. As any dog owner owner will understand, a dog’s favourite bed will often be your own bed or the sofa, so it would be nice to afford the luxury of an inviting dog bed we can use in the living room or upstairs. Lupo will try to sleep on anything, other than the lowly carpet or floor. 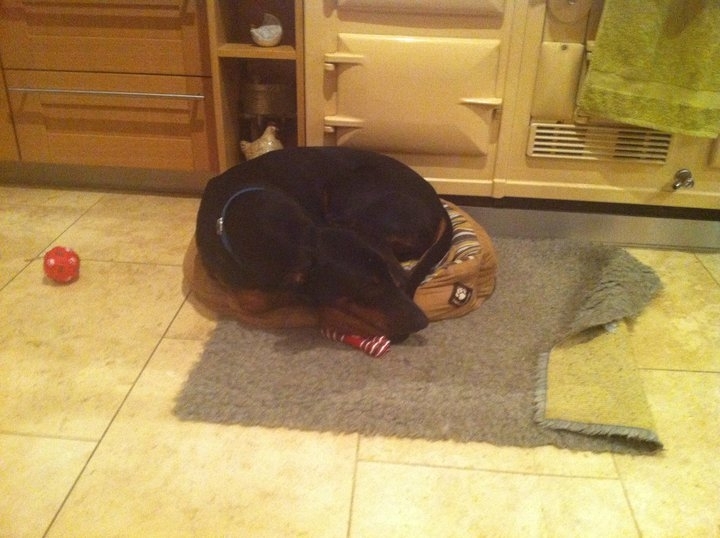 My mum owns a gorgeous Parson Russell Terrier called Bracken, but at a fraction of his size, Bracken’s dog bed was not to be defeated by a Dobermann. Further to this, whilst washing his dog basket blankets one Sunday afternoon, Lupo was so distraught he had nothing to lay on for half an hour, he pulled a fabric placemat from the table and promptly plonked himself on it to sleep. Unfortuntely I didn’t get a photo, not that you could even see what was underneath him it was that small, but it gives you an idea of what I’m up against. Any ideas for beds that would tempt him away from dining ware/other dogs beds, gratefully received. Haha brilliant. We have a two seater sofa he sometimes likes to claim, making it the most expensive dog bed ever. Trouble is he always wants to sit where we are sat and will even steal your seat when you get up, as it’s warm! There’s no hope!